If I am in Japan in the right season, I usually enjoy tasting all the great specialties of the mountain vegetables, such as “udo” and bamboo shoots. My pleasure lasts until I cannot eat anymore. Talking about the king of veggies in Northern Europe, like May or June, it must be white asparagus. Although it is treated a bit different, in the cooking where tastes are accumulated like addition, from our appreciation of some bitterness in our taste buds, the positioning of this vegetable is about the same as “udo” or bamboo shoots. First one in the season is always a hot topic. The regional order of those you find in the stores in Zurich is, first of all, from South America, such as Chile and Argentina, then from the south such as Portugal and Spain. Following them are huge and sturdy ones from Germany, some of which have 2cm in diameter, arranged proudly in the stores. Valleys along the Rhein, from Freiburg to Heidelberg, as well as Brandenburg near Berlin are the famous areas of production. In the markets and supermarkets, they are plied up mountain-high in wooden boxes. A few steps behind, local Swiss ones appear, although they are quite slim. While I hear that they come out almost at the same time every year because of the rigid control of temperature and humidity, they seem to have come out later than usual because of the cold and unstable weather this year. There is one vertically long special pot that was born for the sake of white asparagus. Every year, I hesitate. Should I have it after all? For what else can I use it? And, again this year, I was not convince enough to buy it, and I boiled asparagus horizontally. By the way, as far as I know, every Swiss restaurant cooks them until they get quite soft. As they boil other types of vegetables in this manner, more than enough, I wonder the sense of immersing in boiling water is very Japanases. Since it is a type of “udo,” I have always wondered if they can be eaten fresh. At least why couldn’t they be cooked a bit firmly? This cloud of my question was cleared thoroughly by one recipe posted in the Asahi newspaper a few years ago. Mr. Noboru Taki, the cheff of Le Mnage-Tout, a French restaurant in Ichigaya, Tokyo, showed his way of boiling white asparagus. The skin of white asparagus is quite thick and can be peeled, but should not be discarded. This part holds lots of flavour. By covering with this skin, you boil asparagus in a short time, and finish cooking with the residual heat. Some bitterness is still intact and your asparagus will be crunchy. This was what I was looking for. It is interesting to be given such a proposal of reversal idea, from a gastronomic specialist like Mr. Tani who has a solid basic for classical cooking and also pays attention to the materials. The rich soil that the river brings is suitable for growing asparagus. Just about an hour drive, to the neighborhood of Shaffhausen, corssing the Rhein. 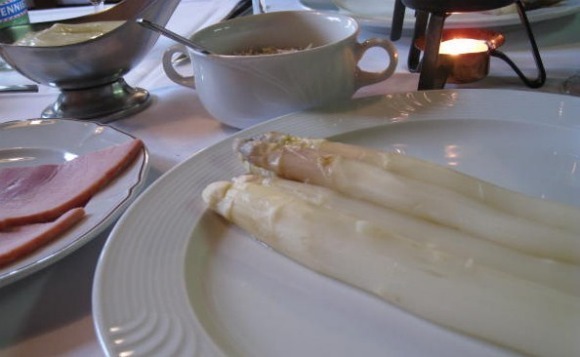 We hear that there are several restaurants in the village called Flaach, where asparagus has been served for some generations and attracting regular customers. 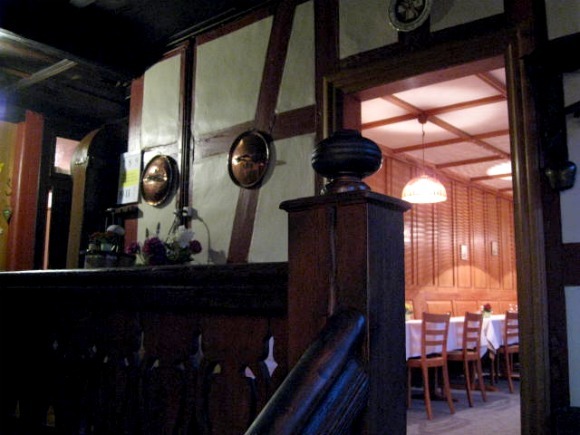 For the sake of white asparagus, the restaurant that we visit once a year is “Obermühle (over the mill).” The place is a remodeled inn in the early 18th century, and heavy stones and woods are used for the architecuture. Lot of antiques are hung on the wall such as a large old clock, cow bells and forks. A huge stone, which used to be a mill stone, is leaning against the entrance, and going up the squeaky stairs form the cold entrance, takes you to the dining room upstairs on your right and left. Although they were serving rustic meals of farm style, we did not look at the menu, as we had one solid purpose. Or, everybody else in the other tables were all eating white asparagus. When our starter was finished, a small pot inside which their homemade butter was melted, was brought to our table with the flame underneath. Next to the pot was finely sliced Gruyere cheese, and good amount of mayonnaise with bright yellow egg-yolk color. The Hollandaise, the usual sauce, which was not welcoming for calory-conscious people, was found in this restaurant. Quite often prosciutto is also served, but here you have a choice of roast ham. Basically, you just keep on eating white asparaguses single-mindedly. Ham is just a side dish. Once your plate is cleared, the next plate of boiled asparaguses will appear in front of you. How much can you eat? Probably, one whole bunch for two. If measured with the skin on, it will be a big volume of about 1 kg. They say poking the tip of white asparagus is a sin. Cutting from the lower part that is close to the earth, the tip part is brought to your mouth softly and respectfully at the very last moment. It is a salute to the power of nature; a kind of courtesy, I believe. The best treat of this season. You take your time to enjoy this simple dinner. The days when computer was not used as much as the present time, whether it was for advertising or book designs. It may sound like a fossil, but in those days, graphic designers used to cut and past finished phototypesetting by cleverly using a cutter knife, to create drafts. The distance between letters was neatly filled out, by picking up each letter one by one like a craftsman, insisting on strict accuracy even by millimeter less than 1mm. Especially they were in Japanese that required combinations of vast variety of letters that were not found in alphabets or other languages, therefore, it was easily understood that all the letters could not be apart from each other at an equal distance. Looking at such manners over my shoulder, I was asked for my opinions for reference, and gradually I found myself demanding not to cut here or I did not like certain typeface and so on, looking at my written work in front of me. While the concept called Swiss Design includes almost every scope of our daily life, such as from typography to stationeries, medical equipments, furniture and architecture, the basic base for the design is the international typography format that was developed in Switzerland after 1950s, or a graphic design style called Swiss Style. 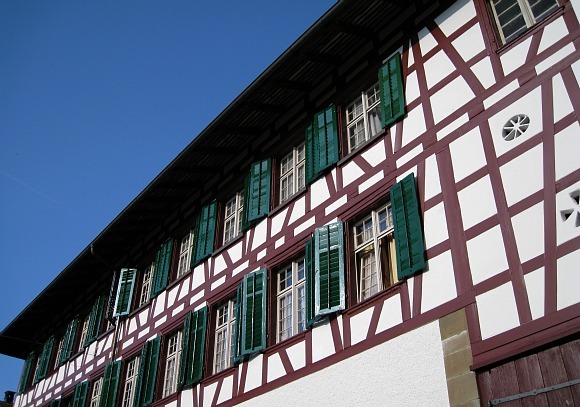 Switzerland where a great deal of avant garde influence of the early 20th century were found, such as Dada, formalism and Bauhaus, and escaped from the calamity of two great wars, started to embrace designs rapidly, which became systemized and lead to a dissemination in the world. The name which you hear repeatedly like a mythology is Akzindenz Grotesk. Futura that was published by Paul Renner who used to teach at Bauhaus became familiar, thanks to the logos of Volkswagen and Louis Vuitton later on. It was 1954 when Adrian Frutiger designed Univers, and in 1957, Helvetica was born by Max Miedinger and Eduard Hoffmann. It is the typeface used by BMW and Lufthansa, and due to its high-frequency use, it has been used quite often for CIs for Japanese corporations. In Switzerland which has 4 languages of German, French, Italian and Romansch, this typeface was named after the Swiss formal Latin name of Confederatio Helvetica, where no disproportionate emphasis would be placed on any of these languages. It is generally believed that the reason why this typeface is easily applicable to any languages is that the mother body of the design consisted of many languages. While this lean Swiss design obtained by trimming any fluff, will be handed down to a new generation, it will encounter many adventures in various fields in the future. In the age where innovative designs are born one after another from the history that minimalism was sought after, when I saw this advertisement, I felt some attention different from a so-to-speak modern and evolved Swiss typography, something that is moving backward. Although it is true that there are many lawyers in Zurich, the center of economy, it sounds like this lawyer is a well-known lawyer in Zurich. 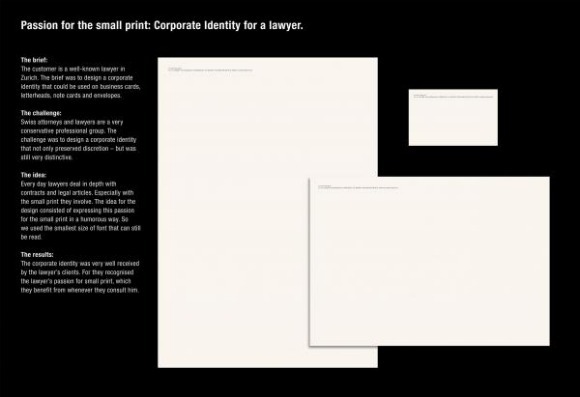 The hint is such small letters in legal documents, that lawyers look closely everyday for business, is lowered in Q numbers that you may want to use magnifying glass to read it. I heard that the humor of this CI design is that how big profit is brought about from such small letters, and how passionately they read such letters. I do not understand well whether this type of joke is the world standard or not. Although it is well legible in the original size, it dared to choose the lowest Q numbers that is legible for understanding. It won a Bronze Lion award in Cannes last year, and has entered in this year’s Clio as well.